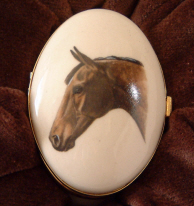 An attractive shaped ceramic horse head trinket box by 'Pointers of London'. Open the box to reveal a further picture of a saddle inside the lid. A lovely gift for the horse rider in your home. Horse and jockeys motif on a plain navy tie. A lightweight equestrian scarf with a variety of horse motifs on a black background.